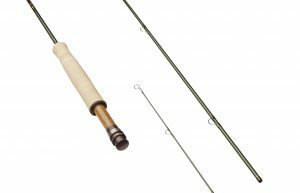 The new DART fly rod from Sage caters to small streams and delicate presentation. Available August 2018. BAINBRIDGE ISLAND, Wash. (July 11, 2018) – Sage, long known for making application specific fly rods, brings small stream anglers the DART in August 2018. Konnetic HD materials combine with performance-friendly action to give the Made in the USA DART a competitive advantage to selective trout in creek environments. The sapling green blank with bronze thread wraps and gold trim wraps perfectly complement the Fuji ceramic stripper guides and ultra-light hard chromed snake guides and tip-top. A vera wood insert with bronze anodized aluminum up-locking reel seat is rounded out with a Super Plus snub-nose, half-wells cork handle. Available in 0-4 weights at 7’6” and a 3-weight model at 6’6” for extremely confined areas, these rods are lightweight and extremely precise. The DART comes with a custom tan rod bag with brown model tag, a Portobello powder coated aluminum rod tube with Sage medallion, and a lifetime warranty. MSRP: $700.